Have you just experienced significant storm damage, fire damage, or flood damage? It’s often best to remove furniture and many other possessions off-site to prevent further harm to them and to complete restoration cleaning and other treatments. That also clears the way for faster building restoration. That probably seems like just more turmoil, but it doesn’t have to be. 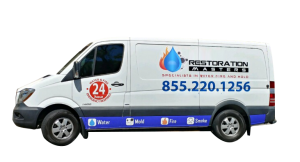 Restoration Masters’ pack out services can take care of everything for you, with 24 hour emergency service 7 days a week. Our experts can quickly “triage,” separating undamaged possessions from belongings that need treatment and those that simply can’t be salvaged. Then our cleaning and restoration specialists can return more items to pre-loss condition (or better) than you might think. Trying to do everything yourself is a huge headache during a difficult and trying time, and improper procedures can make matters even worse. We’ll make a complete and detailed of everything (required for insurance claims and a big help to your peace of mind) prior to careful packing and transportation. If necessary can also store damaged furniture and other items in our secure facility until your insurance claims adjuster can personally inspect them. We’re restoration specialists, not an ordinary moving company. A locally owned and operated contractor, we’re licensed and certified restoration experts, experienced and well-trained in all the specialized technical procedures. That means we’re often able to recover what homeowners or business owners thought was beyond hope. We can provide any pre-treatment needed, careful packing and transportation, and complete any treatments before storage in our secure facility. After your building is ready we’ll return everything to right where it belongs. We can also provide board-ups and other means of securing your property as well as the full range of fire damage restoration, flood restoration, storm damage restoration, and water damage restoration services for the building itself. We’re thoroughly familiar with all major insurance company’s paper work, procedures, and requirements. In particular we will complete all the necessary inventory and loss documentation, and can also complete all of the mitigation steps needed for coverage of secondary harm such as from smoke and water damage. After you’ve notified them that you’ve experienced a loss (your first step), we can begin pack out services. There’s no need for a payment up front. We’ll bill your insurer directly, and wait for your claims payment. Plus we have highly competitive rates for anything not covered. Professional pack out services are a vital part of fire damage repair and flood restoration, as a great deal of detailed know-how is necessary for assessing and properly dealing with smoke and water damage to a building’s contents. We can take care of all your possessions during remodeling or damage renovation: furniture, rugs, drapery and blinds, clothing, electronics, and more. For your complete peace of mind you’ll sign off on the inventory, and of course receive your own copy. Given your list of must-haves we will first separate out undamaged immediate- need items such as clothing and medications, then complete an inventory of all items to be removed, damaged or not. Our restoration experts will determine what items are salvageable with treatment (many more than you might think) and which are unsalvageable. For insurance purposes, we’ll make a detailed inventory of all damage (including taking photographs), what you take with you, what we pack out, what is to be treated, and what is to be discarded. If needed, we can store unsalvageable items until your insurance assessor has had a chance to inspect them. Our friendly experts will be happy to discuss the various trade offs of restore versus replace and pack out versus leave in place for anything you value. We’ll photograph the rooms as well as particular items for documentation, then apply recommend treatments before moving. We’ll carefully pack, pad, and transport all items following proven methods and using approved packaging materials. Our technicians now what’s best for everything from small keepsakes to furniture and major appliances. Some treatments such as initial smoke removal and water extraction may occur on-site, while others will take place in our climate-controlled facility. Our technicians fully understand the specific procedures required for belongings that have been exposed to smoke or water. After removal or isolation from a smoldering or wet location, experts with the appropriate certifications will take care of specialized procedures such as critical surface cleaning and dry cleaning, thorough water extraction and dry out, deep-down cleaning, disinfection, smoke and soot removal, mold abatement, and odor removal. We treat artwork, bedding, blinds, clothing, dishes, documents, drapes, entertainment and computer media, furniture, mattresses, silverware… just about anything. Smoke and water frequently make their way into home electronics and business machines (such as computers, HDTV, stereos, and appliances), even those far from the blaze itself. But quite often we can restore them to working order. After treatment we’ll carefully re-pack everything and store it in our secure facility until you’re ready for its return. After arranging a convenient delivery time, we’ll deliver all items, placing them exactly where you would like. In brief, do-it-yourself removal or hiring a standard moving company are most definitely not good ways to handle furniture and other possessions after a disaster. That likely means damaging what might seem like unharmed items. Delaying proper treatment by just a couple of days can turn recoverable into a complete loss. And you’ll quite possibly be tossing out things that could have been economically saved. Further, without the exact right steps and documentation, an insurance claim can become a nightmare. So avoid all the work and worry and call on Restoration Masters for the best in pack out services.